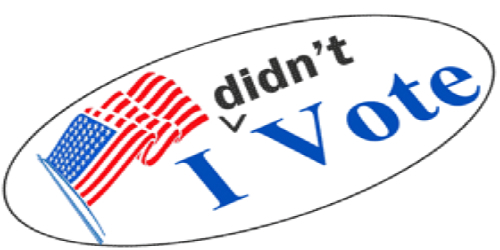 Can Non-Voting Be a Civic Virtue? Given how many Americans have fought and died for our freedoms, one takes little joy in considering that not voting could be a great civic virtue. Furthermore, nothing written here is meant to discourage anyone, particularly first-time voters, from taking part in the electoral process, but, we ask, as with college, is it for everyone? Apathy could be a voice unto itself. Voter participation hovers around 50% in presidential elections (and somewhat lower in mid-terms). Why is it so important to the political class that we vote? We’ve all heard it said, “It doesn’t matter who you vote for as long as you vote.” Why? It’s bad enough that the ruling class steals our sustenance and freedom, now they want our consent! Our founders saw the folly of pure, undiluted democracy. That is why the states, technically speaking, pick the president. Our system is based, not on unlimited popular rule, but a system of checks and balances to temper the passions of the majority. Would our founders approve of bribing the citizens with vacations, cars and electronics in exchange for voter participation? Judging by the gimme-gimme mentality they are nurturing, it certainly does matter to the ruling class who we vote for: anyone who keeps them relevant and employed. Such blatant pandering to the public hasn’t taken hold in the US, but sit tight. Motor voter, early voting, and same-day registration are enticements to draw in the lazy and those who deem Kanye West a profoundly deep thinker. A town in Norway offered free vacation vouchers to first-time voters – and saw a 10% spike in turnout. A similar experiment was tried in Bulgarian parliamentary elections a few years back, with cars, computers and cell phones used as the proverbial candy-from-a-stranger. Civic do-gooders tout 80, 90% turnout as a panacea, an axiomatic cure for cynicism and apathy. Here’s a better idea – let’s have honest public servants who put the people ahead of their own ambitions. Let’s propose a system that functions within its Constitutional limitations, where the rich and powerful enjoy no incentive to rig the game in their favor. Bloated government could not exist without masses voting themselves countless goodies for both long and short-term sustenance. Our democratic process, as we practice it, while still the best in the world, fosters division and a free-for-all for dollars and perks, the fires of discord fueled by the vote. Bernie Sanders, who never met a handout he didn’t like, has called for making election day a federal holiday. Every cycle brings public hand-wringing over ways to make voting easier. Yes, that is actually a problem to some. With absentee and early voting, no one can really claim that the act of voting needs to be made easier. Still, Think Progress (among other organizations) favors online voting, and Forbes.com (certainly not the most liberal-leaning outpost) favors same-day registration. If voting were any easier, there is no reason to believe it would be more valued. Maybe a right so precious should be little inconvenient, thus giving it weight and significance. As to early voting, people have this mad rush to beat their friends to the polls, as if for bragging rights. Ideally, early and absentee voting would be reserved for those hardship cases that absolutely can’t make it on election day. According to some figures, over 10 million Americans had already voted before news broke that the FBI was resuming its Clinton email investigation. Public opinion, as we know, can shift in a single news cycle. The non-voter is typically considered apathetic, a slacker. That notion is not entirely false. Nonetheless, non-voters perform a vital public service. Call them lazy, but no one seduces them with the promise of free health care and college tuition, etc. Call them slackers, but they do not predicate the nation’s leadership on their own economic self-interests. They don’t march into the voting booth on orders from their union or employer. They are not seduced by slick-talking orators. Wherever they invest their faith, they don’t look to the halls of Congress for their spiritual or material wealth. Our founders envisioned an engaged, if not vigilant citizenry. But we put liberty at risk by encouraging the participation of those who vote solely on self-interest or those who consider TMZ a hard news source. Bottom line, it is not the concept of voting that devalues a free society. It is in de-emphasizing the responsibility of making rational, informed decisions based on the common good. Like college, voting can bring great benefits, but entails great responsibility and is not for everyone. GOP Cooking ShowCubs? Indians? Trump?